Ian Manuel will speak at the University of Evansville on Monday, October 22. The lecture, which is free and open to the public, begins at 7:00 p.m. in Eykamp Hall room 251 within Ridgway University Center. Manuel will be discussing his experience of being sentenced to life imprisonment as a juvenile and his eventual release through the help of his victim turned advocate and the Equal Justice Initiative. Manuel was 13 years old when he was sentenced to life for shooting Debbie Baigre, a young, white woman. He served 26 years of his sentence, much of it in solitary confinement due to his young age. Baigre became his supporter and friend, advocating for his early release. On November 10, 2016, Manuel was released from prison at the age of 40. His case paved the way for other groundbreaking legislation prohibiting life sentences for juveniles convicted of non-homicide offenses (Graham v. Florida, 2010). All juveniles sentenced to life in prison at that time in the US for non-homicide cases were children of color. Manuel’s remarkable story is included in the bestselling book Just Mercy: A Story of Justice and Redemption, written by Bryan Stevenson, founder of the Equal Justice Initiative. This event is co-sponsored by the University’s Psychology Club, Student Government Association, the Black Student Union, and the Department of Law, Politics, and Society. Maggie Stevenson, University of Evansville associate professor of psychology, and Cynthia Najdowski, assistant professor at the University at Albany, have co-edited and published a book titled Criminal Juries in the 21st Century: Psychological Science and the Law. The book is part of the American Psychology-Law Society Series and was published by Oxford University Press. This book explores the increasingly wide gulf between criminal trial law, procedures, and policy, and what scientific findings have revealed about the human experience of serving as a juror. It provides a unique view of criminal juries with the goal of increasing awareness of a broad range of current issues in great need of theoretical, empirical, and legal attention. It also identifies how social science research can inform law and policy relevant to improving justice within the jury system. Stevenson has published over 30 peer-reviewed articles and book chapters related to factors that shape juror decision making and the nature of jury deliberations. She also explores perceptions of marginalized individuals, including children and minorities, who enter the legal system, either as victims or as perpetrators of crime. Her research has received grants and awards from divisions of the American Psychological Association. Najdowski’s research explores how social psychological phenomena shape criminal justice interactions in ways that produce miscarriages of justice for minorities, women, and children. Her work has been recognized with several national grants and awards and published in the top-ranked journals in the field of psychology and law. Lora Becker, professor of psychology at the University of Evansville, was recently elected to serve on the board of directors for The Honor Society of Phi Kappa Phi - the nation’s oldest and most selective collegiate honor society for all academic disciplines. The election took place August 4 during the Society’s Biennial Convention in Minneapolis, Minnesota. In this role, Becker will represent the membership of Phi Kappa Phi while also working to support the mission and goals of the Society. She will serve a two-year term during the 2018-2020 biennium. Becker has been an active leader of Phi Kappa Phi at the local and national levels since 2014. She has held a number of roles within the University of Evansville chapter of Phi Kappa Phi, including president, a position she assumed in 2015. Becker was also chair of the 2016 Biennial Convention Credentials Committee for Phi Kappa Phi and most recently served as chair of the national Bylaws Committee for the 2016-18 biennium. Becker received her B.S in biology and psychology from Wright State University. She earned her M.A. in psychobiology and Ph.D. in behavioral neuroscience from State University of New York at Binghamton. Phi Kappa Phi was founded in 1897. Membership is by invitation only to the top 10 percent of seniors and graduate students and 7.5 percent of juniors. Faculty, professional staff and alumni who have achieved scholarly distinction also qualify. Some of the organization's notable members include former President Jimmy Carter, retired NASA astronaut Wendy Lawrence, novelist John Grisham and YouTube co-founder Chad Hurley. Each year, Phi Kappa Phi awards nearly $1 million to outstanding students and members through graduate fellowships, study abroad grants, member and chapter awards, and grants for local, national and international literacy initiatives. For more information, visit www.phikappaphi.org. Robert Dion, chair for law, politics, and society, was interviewed by the Evansville Courier & Press about the sudden exit of two 8th District Democratic congressional candidates this week. You can read the article on the Courier website. University of Evansville associate professor of psychology and director of the neuroscience program Lora Becker was named the recipient of the 2017 Eykamp Prize during the University’s 159th Commencement exercises. Becker is the second recipient of the honor. The award was established through the generosity the Eykamp family as a way to recognize extraordinary contributions made by UE faculty to the University. Becker came to the University of Evansville nearly 18 years ago from the State University of New York-Binghamton where she earned a Master of Arts degree in psychology-psychobiology and a PhD in psychology-behavioral neuroscience. She earned a Bachelor of Science dual degree in biology and psychology from Wright State University. At UE, she has been named a Global Scholar, and she is passionately involved in the GAP Program that focuses on neuromarketing. Becker directed the summer reading program for several years as well as the major discovery program for undeclared students. She is known for reaching across campus to all departments, schools, and colleges to develop curriculum and undergraduate research opportunities. Associate professor of psychology Lora Becker and B. J. Miller '16 (currently in graduate school at St. Louis College of Pharmacy), Victor Deere '16, Kay Sheets, '17, Nehchal Bedi '17, and Keeton Mays '18 presented "The Addictive Potential of Artificial Sweeteners" at the Society for Neuroscience, which boasted over 30,000 attendees this year. This work was supported by the Department of Psychology and Neuroscience. Craig Bryan, prominent suicide researcher and leading national expert on military suicide, will be speaking and leading a workshop for clinicians at the University of Evansville on Thursday, November 10. His visit to UE’s campus is being hosted by the Office of Veterans Affairs at the University. Bryan is a 2001 graduate of UE. Bryan researches suicidal behaviors and suicide prevention strategies, and psychological health and resiliency. His techniques have been utilized by the US military. Currently Bryan serves as executive director for the National Center for Veterans Studies. Highly sought after as a media source, Bryan has been frequently interviewed by such entities as the New York Times, Huffington Post, USA Today, Fox News, CNN, and Frontline. This free workshop led by Bryan for area clinicians will utilize crisis response planning, a technique for managing suicide risk. Clinicians wishing to attend should contact CL29@evansville.edu or 812-488-2141. Deadline to register is November 1. This workshop is being co-sponsored by the VA Evansville Health Care Center, Deaconess Cross Pointe, St. Mary’s Behavioral Health, and Brentwood Meadows. No reservations are needed to attend this free, public presentation by Bryan on understanding the warning signs of suicide, interventions, and what can be done to help. While this lecture will be of interest to the general public, it will be especially informative for family members and friends of individuals at risk for suicide. Bryan is a board-certified clinical psychologist in cognitive behavioral psychology, He earned his PsyD and MS degrees in clinical psychology from Baylor University, and his BS degree in psychology from UE. In 2009, Bryan deployed to Iraq, where he was director of the Traumatic Brain Injury Clinic at the Air Force Theater Hospital. He later separated from Air Force active duty service. Bryan currently manages numerous federally-funded projects in excess of $10 million, which include testing cognitive behavioral treatments for suicidal service members, He is lead risk management consultant for the $25 million STRONG STAR Research Consortium investigating treatments for combat-related PTSD among military personnel. Bryan is on the board of directors of the American Association for Suicidology. He is a consultant to the Department of Defense for psychological health promotion initiatives and suicide prevention, where he has briefed Congressional leaders on these topics. He provides training to clinicians and medical professionals about managing suicidal patients. Bryan has written dozens of scientific publications and book chapters, and has authored many books, including Managing Suicide Risk in Primary Care, Cognitive-Behavioral Therapy for Preventing Suicide Attempts: A Guide to Brief Treatments Across Clinical Settings, and The Handbook of Psychosocial Interventions for Veterans and Service Members: A Guide for the Non-Military Mental Health Clinician. For his contributions to primary care behavioral health and military suicide prevention, Bryan was recognized by the Society for Military Psychology with the Arthur W. Melton Award for Early Career Achievement. For more information, call 812-488-2141 or e-mail CL29@evansville.edu. Senior sociology and psychology major Mackenzie Gammans was awarded the 2015-16 Hanns G. Pieper Senior Research Award in Sociology and Criminal Justice for her senior research project entitled, "Media and Stigma of Mental Illness." The honor is awarded annually to the outstanding independent research project conducted, written, and presented by a student majoring in sociology, anthropology, gerontology, and criminal justice. The award is named for emeritus professor of sociology Hanns Pieper, for his dedication to promoting independent student research in sociology and criminal justice at UE for over two decades. The University of Evansville’s Psychology Club will host a panel discussion on “The Psychology of Parenting,” on Thursday, Nov 12, 7:00 p.m. in Room 170 (Smythe Lecture Hall) in the Schroeder Family School of Business Building. A panel of psychologists will be discussing parenting techniques and strategies, covering a range of issues parents typically encounter, and offering best-practice approaches. This event is free and open to the public. The University of Evansville has been awarded a Ball Brothers Foundation Venture Fund Grant of $22,000 for its newly instituted Neuromarketing Research Center. Through the Neuromarketing Research Center, interdisciplinary student teams serve clients by testing responses to various marketing elements and tactics using leading-edge neuroscience techniques. “The Neuromarketing Research Center is a great example of the interdisciplinary training that occurs at the University of Evansville,” says UE associate professor of psychology Lora Becker. UE assistant professor of marketing Atefeh Yazdanparast explains that neuromarketing is a relatively new research discipline that combines neuroscience with marketing. The Neuromarketing Center is a part of the University’s successful GAP program. The program will also offer opportunities for UE faculty and students to engage in neuromarketing research on a global level. Yazdanparast and Becker will kick off this global research with initial work in Australia and China this year. The Ball Venture Fund was created in 1999 to enable the Ball Brothers Foundation to take an active role in encouraging and supporting creative efforts at Indiana’s independent colleges and universities. 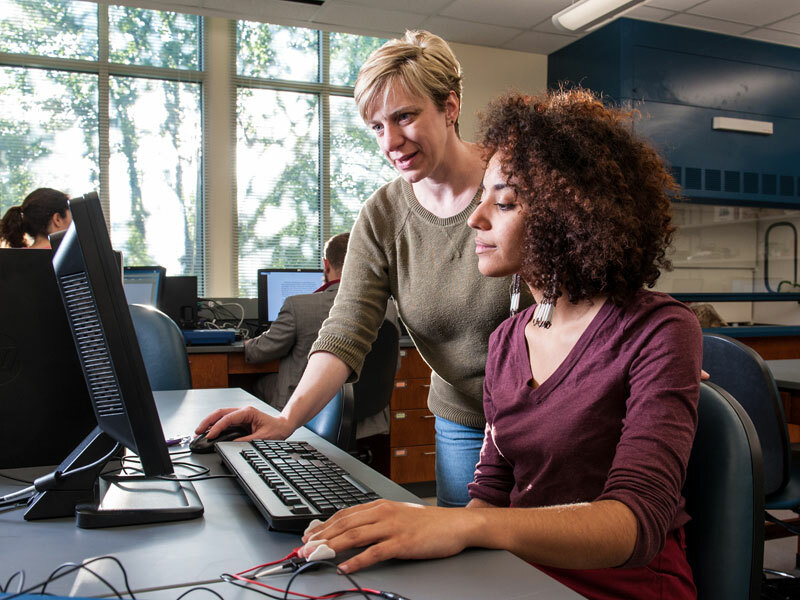 The program, administered by the Independent Colleges of Indiana (ICI), provides seed money for innovative start-up programs at ICI member institutions. The GAP Program is supported by a grant from Lilly Endowment Inc.
University of Evansville associate psychology professor Margaret Stevenson was named the 2015 Outstanding Teacher at the University during UE’s 157th Commencement Exercises May 9. Stevenson has been a professor at UE since 2008, teaching courses in such areas as social psychology, research methods in psychology, and psychology and the law. She serves as advisor to many psychology majors, advising and directing some in their research projects. Stevenson is a senior thesis mentor for many students, and co-faculty advisor for two UE student groups, Psi Chi and the Psychology Club. She was honored with the Sydney and Sadelle Berger Award for Research in 2012, and the Association for Psychological Science RISE Research Award in 2011. In 2014, Stevenson was presented with the United Methodist Exemplary Teacher Award by the General Board of Higher Education and Ministry of the United Methodist Church. Stevenson is a past recipient of the American Psychological Association Division 37’s Section on Child Maltreatment Early Career Award. She is a member of such professional organizations as the American Psychological Association, Society for the Psychological Study of Social Issues, and Society for Personality and Social Psychology. She serves on the editorial board for the Journal of Forensic Psychology and the International Journal of Psychological Studies. At UE, Stevenson has been Honors Faculty Scholar in Residence, and has served on the Institutional Diversity Council, Honors Program committee, and General Education Subcommittee She has been the social sciences representative for UE Faculty Senate, as well as corresponding secretary and parliamentarian. A new suicide rate system, created by Dr. Mark Kopta, UE professor of psychology, has been picked up by the U.S. Department of Defense. Kopta is founder and executive director of the CelestHealth Solutions Research Group which studies behavioral health as well as outcomes of psychotherapy treatment. The Behavioral Health Measure-20 questionnaire uses 20 items to “comprehensively” assess mental health including depression, anxiety, eating disorders and bipolar disorder. It also features a “valid and reliable” color-coded suicide risk indicator that Kopta said rates patient risk at four levels — no risk, low, medium and high. “The reason why they (U.S. Department of Defense) like it is because it’s brief, at only 90 seconds ... And something that the military was very attracted to also was it has a suicide monitoring scale,” Kopta said. Click here for more information on this system in an article from the Evansville Courier and Press that features an in-depth interview with Dr. Kopta. The University of Evansville's Psychology and Law Research Laboratory is looking for people to play mock jurors in a mock trial, as part of a grant-funded research project. Any U.S. citizen who is 18-years-old or older can participate. Those participating will receive $40 for their time. Those who would like to participate or who have questions, should contact research laboratory manager Evan McCracken at em157@evansville.edu. Emily Durbin, associate professor of psychology at Michigan State University and University of Evansville graduate, will return to UE as guest speaker for the November Crick Lecture in Cognitive and Neural Science. The event will be Wednesday, November 12, from 4:00-5:00 p.m., Room 100, Koch Center for Engineering and Science. This event is free and open to the public. The topic of Durbin’s lecture will be her research into the emotional life of children, which she studies in her lab at Michigan State (MSU Child Emotions Lab). Areas studied include temperamental differences in emotional experience and how these are related to the family environment and parents' personality and emotions. Durbin earned her bachelor’s degree from UE and her master’s and PhD from State University of New York at Stony Brook. My CelestHealth Research Group (CHRG) has recently had papers published or in press for publication. Kopta et al (in press) is an especially interesting study. One of our recent graduates Danielle Raymond is a coauthor with counseling center Directors from Johns Hopkins University, Harvard University, and University of Minnesota as well as faculty from Marquette University. This study included a research sample of over 13,000 patients and 400 psychotherapists. Additionally, UE graduate Craig Bryan, who is now a professor at the University of Utah, is first author on another paper (Bryan, Kopta, & Lowes, 2012). Stulz, N., Lutz, W., Kopta, S.M., Minami, T., & Saunders, S. (in press). The shape of the dose-effect relationship in outpatient psychotherapy: Does treatment duration matter? Journal of Counseling Psychology. Kopta, S.M., Petrik, M., Saunders, S., Mond, M., Hirsch, G., Kadison, R., and Raymond, D. (in press). The utility of an efficient outcomes assessment system at university counseling centers. Journal of College Student Psychotherapy. Budge, S.L., Owen, J.J., Kopta, S.M., Minami, T., Hanson, M.R., & Hirsch, G. (2013). Differences among trainees in client outcomes associated with the phase model of change. Psychotherapy, 50, 150-157. Bryan, C.J., Kopta, S.M., & Lowes, B.D. (2012). The CelestHealth System. Integrating Science and Practice, 2, 7-11. Assistant Professor of Psychology Maggie Stevenson has recently published three journal articles. One manuscript, titled “Socioeconomic Status Influences Perceptions of Juvenile Offenders Tried in Adult Court” was published in the current issue of Psychology, Crime, and Law (vol. 9) and is co-authored with a UE psychology major alum, Katlyn Farnum (Sorenson), who is currently a doctoral student of psychology at the University of Nebraska, Lincoln. Margaret C. Stevenson and Mary C. Mohn have been named the winners of the 2012 Sydney and Sadelle Berger Awards, presented each year to members of the University of Evansville faculty who demonstrate exceptional scholarly activity and service. Stevenson, an assistant professor of psychology, received the award for scholarship, and Mohn, an associate professor of Spanish, earned the award for service. Charlie Berger, a 1969 UE graduate and local attorney with the law firm Berger & Berger, presented both awards today at the University’s annual Fall Faculty and Administrators Conference. Stevenson, the winner of the award for scholarship, is early in her academic career, but has already proven herself a prolific author of journal articles, chapters, and other publications. She has also completed nearly 50 conference presentations, many of them with UE students. Her research focuses on the intersection of children, psychology, and the law, and she has won awards from several organizations in her field. Most recently, she received the Association for Psychological Science’s RISE UP Award for a study on anti-Arab prejudice and stereotypes. The award recognizes outstanding research on socially and economically underrepresented populations. Stevenson serves as director of UE’s Psychology and Law laboratory, and is an academic advisor and senior thesis mentor for psychology majors. She holds a PhD in social psychology from the University of Illinois at Chicago, and she joined the UE faculty in 2008. Mohn, who won the award for service, has been instrumental in helping the University recruit outstanding students and faculty, and in building connections between UE and the community. She has served on the University’s admissions and standards committee since 2007, chaired the curriculum committee for several years, and has participated in numerous search committees for tenure-track faculty positions in the Department of Foreign Languages. She also serves as a member of UE’s assessment committee and chairs the popular Andiron Lecture Series in the liberal arts and sciences. Mohn received the Dean’s Teaching Award for UE’s College of Arts and Sciences in 2010, and this past year, she was appointed director of the new general education program. She earned her PhD in Spanish from the University of Kansas and has been with the University of Evansville since 2005. The Berger Awards are presented annually in memory of Sadelle and Sydney Berger. Sadelle was a UE graduate and lifelong member of the Academy of Arts and Sciences at UE, while Sydney was a well-known local attorney. Both dedicated their lives to public service. The Berger family established the endowment to give recognition to faculty at the University of Evansville.